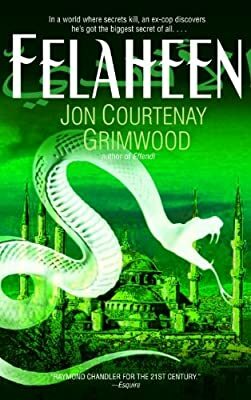 In a world where secrets kill, an ex-cop discovers he’s got the biggest secret of all. . . .
Set in a 21st-century Ottoman Empire, Jon Courtenay Grimwood’s acclaimed Arabesk series is a noir action-thriller with an exotic twist. Here an ex-cop with nothing to lose finds himself on the trail of a man he doesn’t believe in: his father. Ashraf Bey has been a lot of things—and most of them illegal. Now, having resigned as El Iskandryia’s Chief of Detectives, he’s taking stock of his life and there’s not much: a mistress he’s never made love to, a niece everyone thinks is mentally incompetent, and a credit card bill rising towards infinity. With a revolt breaking out across North Africa, the world seems to be racing Raf straight to hell. The last thing he needs is a father he’s never known. But when the old Emir’s security chief requests that Raf come out of retirement to investigate an assassination attempt on His Excellency, that’s exactly what Raf gets. Now, disguised as an itinerant laborer, Raf goes underground to discover a man—and a past—he never knew . . . and won’t survive again.